Football fandom is changing. Just over a decade ago, the majority of football supporters were those who attended the games of their team of choice. Granted, there was the odd poor soul labeled as a “glory hunter”, most notably in my native Scotland for having an “English team” to go with their local Scottish team, but overall a large portion of fans were interested in the local rather than the global. With the continued growth of digital satellite television, combined with the all-engulfing development of the internet, romantic notions of local fandom are becoming a thing of the past.With teams from all over the world now beamed into your living room on a nightly basis, and the ability to interact with fellow supporters instantly provided via social media and message boards, you no longer need to be able to go to the stadium to support the team. The biggest teams in the pack lead the way, Barcelona, Real Madrid, Manchester United and Liverpool have large groups of fans all over the world. A byproduct of this is that local teams now tend to struggle more as a result, though that’s another story. In La Liga in particular, with Barcelona and Real Madrid’s exploits in Europe, you are equally as likely to encounter someone claiming to be a supporter that has never actually seen either team play in person than a Catalan or Madrileño. Countless blogs, forums, youtube channels and more provide news, features and information for the global fan. These are rarely in the local languages of Catalan or Castellano either (quite often the writers don’t even understand them). On the one hand, this is a useful tool for the clubs in marketing their products to a broader audience. Foreign supporters who read such blogs are likely to be interested in merchandise, glamour friendly tours in the summer and more. Likewise, it ensures that companies like Sky continue to show an interest in La Liga and therefore continue paying big bucks for the rights. There is a negative side to all this however, and I would suggest it’s growing. Pressure on footballers is nothing new, but in the past it was mostly resigned to within the stadium or via the press. At Barcelona, Dmytrio Chygrynski provided a perfect example when he recalled how he felt upon receiving a wave of boos from the fans at the Camp Nou. Xavi Hernandez told the big Ukranian defender that it was nothing new, and incredibly, something he had experienced himself at times in the past. These are grown men and they’re paid a fortune, so to an extent we can expect them to deal with an aspect of football that has been around for years. In theory, the cream will rise to the top, and the boos will be silenced. It is when these jeers are resigned to text however, more often than not via near hate campaigns by so called fans, and then directed to youth players that are still only kids that it becomes problematic. Taking Barcelona as an example, this kind of behaviour has become worryingly regular in recent years. 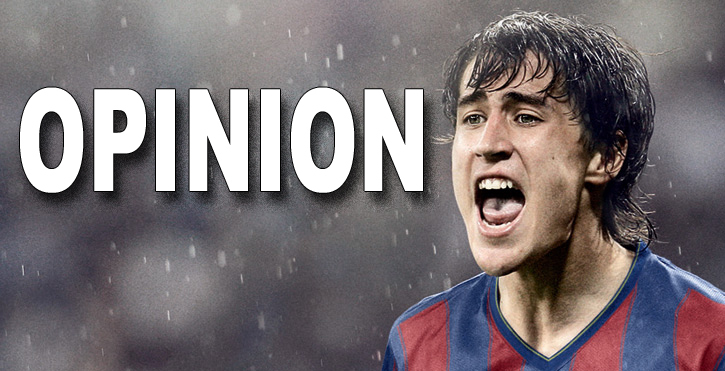 Bojan Krkic, despite being barely considered an adult in the eyes of the law, was subject to waves of abuse by fans on Barcelona forums during the more difficult spells at his time in the Barça team. Amazingly, the majority of this tended to come from the international fans mentioned earlier. This can in part perhaps be explained by the fact that Bojan is a local boy and as such Catalans show lenience towards him, but I’d also suggest it’s down to the lack of negativity applied to him by the local media. The Spanish press, for the most part, is reluctant to criticise its own darling players due to the partizan nature of the big papers. The international fans however, many of whom can’t even read the local papers due to language barriers (and therefore have no interest in it) seem drawn in by an internet mob mentality. A few posts soon become a trend, until suddenly the player in question (this time Bojan) is persona non grata amongst these supporters. It doesn’t stop at first team level either. Recently I was amazed to discover that certain players in Barcelona B (who are by the way still in their mid teens) have suddenly become the flavour of the month to be hated by these self-righteous guardians of “good football” patrolling the internet. It seems ludicrous that youths so talented they’re breaking in to a professional second division side at the best team in the world are ridiculed for a sub-par performance or two, but it happens regularly, pathetic though it may be. With the development of the Nextgen Series, footballers from an even younger age than those at the B teams will become stars sooner than before. If events follow those that have preceded them, heaven help those young prospects if they put a foot wrong. So what? You might say. One argument often given is that the kids at Barcelona, Madrid or elsewhere won’t read or even understand the comments (after all, they’re usually in a different language than their native one). Such a notion is nonsense. The youth talent at the top teams in Spain are provided with an excellent education and, in line with contemporary Spanish culture, are likely to have a decent standard of English at the bare minimum. Own up: anyone who has ever been in the spotlight at all has probably googled themself at least once, and those players are no different. It’s not a stretch to imagine that they’re away of the vitriol that is directed towards them by so-called supporters, then. I realise of course than in writing this piece I’m more likely to incur the wrath of said idiots than inject any common sense into them, but I ask that anyone who feels that they may be targeted by my words stop and think for a moment. At the end of the day, who will benefit from the negativity generated by such behaviour? No one, but particularly not the players in question. Perhaps if these guys dedicated as much time giving support to players they suppsedly follow or, and here’s a ridiculous notion, thinking for themselves rather than just doing whatever one of their so called friends do (who they’ve never met in real life anyway), these people might prove to be fans after all. Something has to give. For my sanity at the minimum. Very strange article, mixing several concepts without real line. Would advice you to first get your thoughts straight and then write a coherent article. Don’t find the logic in this one, to be honest, what’s exactly your point? Being active on both local and “international” forums, I can guarantee you that for example the criticism against Bojan was probably heavier on the local ones, so that “example” is wrong to start with. You’re building your whole theory -ahum- on wrong assumptions. Nothing good can come from that. The Barcelona B suggestions don’t even have an example, don’t know where that is coming from. Any names? And those players aren’t in their “mid teens”, but – with an exception higher or lower – are aged 18-22. Seems you’re among those “countless blogs” who have to produce a piece every day and end up not knowing what to write about anymore. Then one day you try to be a “guardian of good fandom”. Me being a international Valencia fan who isn’t that good in Spanish(yet, I’m trying to learn the language but can’t find the time). I can somewhat relate to this, those ”typical” fans do annoy me a lot. I can’t even describe how much they annoy me and how often I have to face-palm myself over their stupidity. Some of them do posses some sense but as soon as you rate them for being ”normal” they come up with something out of the ordinary. But there are a lot of good international fans and often you will find some of them speak the language of the team they support. 1 thing however I have to add is that as a Valencia fan I can say that we might be the only team in Spain where the local fans are ”worse” than the international fans. A lot of us are still supporting Emery and are less demanding than the local fans which is pretty uncommon compare to the usual international fan. I think there are two reasons for this: 1. The local fans are quite bad and 2. Because Valencia aren’t as big or popular as e.g. Madrid so less people are fans of the club and so you will find a lot more sensible people. Great article Lee and I could not agree more with your points. The abuse that some players get on internet forums and social media sites is, quite frankly, disgusting. Bojan was a good case in point -I don’t know what local forums you are talking about Jean but the abuse he received outside Catalunya was far worse in my opinion. – Valencia fans are notorious for being impatient, moreso than Real Madrid or Barcelona. Perhaps that’s an interesting dividing line when looking at my argument. – The international community of Valencia fans, as great as they are, is significantly smaller than Barcelona or Madrid. They simply don’t generate the same numbers. I think it’s interesting therefore that the larger online international communities (particularly Barcelona’s) can be so overwhelmingly negative, when smaller ones like Valencia’s aren’t. Less pack mentality?